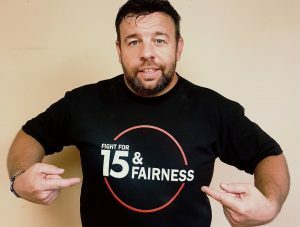 BELLEVILLE – Despite talk that the Ontario minimum wage increase could be bad for businesses, the head of the local chamber of commerce is working with poverty activists to support employers paying a living wage. Jill Raycroft, the chief executive officer for Belleville’s Chamber of Commerce, says she supports a living wage and is working with the Hastings-Prince Edward Poverty Roundtable and the Community Development Council of Quinte to recognize participating businesses. “There might be something that we could put in place that would recognize those employers that are already doing that. We are just starting that conversation. I am fairly confident that we would have a number of our members that would already qualify. I don’t know the criteria yet and so that is the challenge,” she said. Once the Belleville living wage is calculated, some sort of recognition is what Raycroft has in mind. Belleville’s living wage is being calculated right now with the help of the poverty roundtable, she said. The report, which follows the same guidelines set by the Ontario Living Wage Network calculated the 2016 Belleville Living Wage as $16.70. The 2017 living wage calculation is in the works, Roundtable member Bob Cottrell said in an email to QNet News on behalf of the Hastings-Prince Edward Poverty Roundtable. A living wage is an hourly wage that a worker needs to earn in order to cover their basic expenses and to participate in their community, said Anne Coleman, employer enrolment manager for the Ontario Living Wage Network. When calculating the living wage, she uses the Canadian Living Wage framework and in there it spells out what information or what data you need to find in each community. The network works with employers to calculate the local living wage, she said. “The items that we include are food, clothing, shelter, child-care, transportation, non-OHIP medical expenses, recreation and a modest vacation. The living wage is not just covering the basic expenses, it is also including participation in the community. We really want to make sure a family has the opportunity, for example, to have a membership at their local YMCA. We include a modest one-week camping vacation for a family of four,” Coleman explained. But it is not just activists who want to see a living wage. Some businesspeople want it, too. The Better Way Alliance is made up of Canadian business owners that offer good job strategies that benefit employees and the Canadian economy at large so people can afford their basic needs. Damin Starr is one of those employers. He is one of the five founding businesses of the Better Way Alliance and is a certified living wage employer. His company, Pre-line Processing, located in the Golden Horseshoe region, pays a living wage. The Niagara manufacturing company was hit hard when the 2008 Great Recession crippled business owners, and Starr said it caused him to re-evaluate how he ran his company and how he could better value his employees so they could be more productive. Starr lives in Hamilton, and said its chamber of commerce is a certified living wage employer. Yet, the Ontario Chamber of Commerce is not. “The Ontario Chamber of Commerce was advocating against paying people $14 and of course $15 an hour. They softened their position once our organization was out there in saying, ‘This should already have been done. You guys just aren’t catching up,” Starr explained. He said he is excited to hear that Belleville’s Chamber of Commerce is a living wage advocate. In 2012, Starr and his employees decided workers would be paid a starting wage of $15.50. This was back when the minimum wage was $10.25. His current business strategy fosters a positive long-term relationship with his employees. The living wage conversation is one every community should be having, Starr said.